OBD IVR is an fascinating application for publicizing any important information about any meeting, promotional offers or updates regarding any upcoming activity. All these can be done in one go with the help of ARIA OBD IVR. It is quite beneficial for any organization or even for personal use in order to send the information to all the activity related groups. It saves time and is user friendly as we can make it active as per the time slot we require. It is a simple plug and run device. Its functional area could be : any public meeting, fire incident, emergency, any social activity , election campaign, payment reminders, service reminder, birthday anniversary greetings, transaction alerts OTP sending. Trunk Lines: Parth OBD IVR Can be used with ISDN PRI lines, VOIP Trunk & GSM Gateways, Calls are cheaper on GSM network these days & easy to connect, so it helps the client to reduce the cost of the process. Our System can filter do not call registered number if to be used for promotional call. 500 to 2.5 Lakh calls per day. PARTH 4 PORT : It gives you facility to blast any important information at one go. It will give you the 4 agents user license for OBD IVR blasting. It can be connected via GSM /PRI/SIP trunk and can have maximum calls output. It gives the functionality to create the IVR call flow as required by the user. PARTH 8 PORT : It gives you facility to blast any important information at one go. It will give you the 8 agents user license for OBD IVR blasting. It can be connected via GSM /PRI/SIP trunk and can have maximum calls output. It gives the functionality to create the IVR call flow as required by the user. PARTH 16 PORT : It gives you facility to blast any important information at one go. It will give you the 16 agents user license for OBD IVR blasting. It can be connected via GSM /PRI/SIP trunk and can have maximum calls output. It gives the functionality to create the IVR call flow as required by the user. PARTH 32 PORT : It gives you facility to blast any important information at one go. It will give you the 32 agents user license for OBD IVR blasting. It can be connected via GSM /PRI/SIP trunk and can have maximum calls output. It gives the functionality to create the IVR call flow as required by the user. PARTH 30PO PORT : It gives you facility to blast any important information at one go. It will give you the 30 agents user license for OBD IVR blasting. It can be connected via PRI trunk and can have maximum calls output. It gives the functionality to create the IVR call flow as required by the user. It requires a PRI card to get connected and make 30 agents live for the process. PARTH 30IO PORT : It gives you facility to blast any important information at one go. It will give you the 30 agents user license for OBD IVR blasting. It can be connected via SIP trunk and can have maximum calls output. It gives the functionality to create the IVR call flow as required by the user. It requires a PRI card to get connected and make 30 agents live for the process. 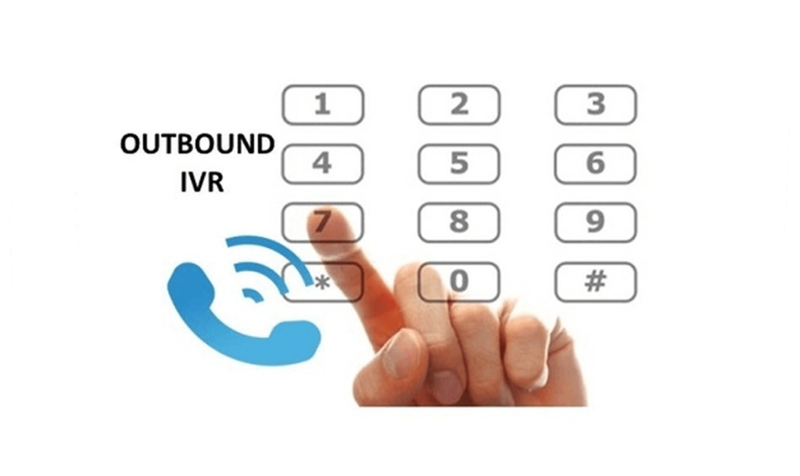 Q1)	What is Outbound IVR? Outbound IVR allows you to throw call on hundreds number of customers for like Surveys, Renewal insurance policies, Health Schemes, Payment reminders or any special festive offers etc. Q2) How many calls we can throw in one day? It depends on your data &of course on calling medium as well either you go with the PRI line or GSM gateway. Q3) What is the requirement for hosted Outbound IVR Solution or on premise solution? Hosted Solution: We would require only internet in your system where you can login into web interface to upload the numbers or monitoring the reports. On Premise Solution: The system will be place in your premises and whatever technical requirement will be needed, provided by client side like Server (Optional), Power, LAN, Cables, Switch & Calling medium like PRI line, GSM SIM etc. Q4)	Is there any recurring cost involve in? For on premise solution setup costing will be one time but there will be recurring cost involve like rental of PRI, Plan of GSM SIM. Q5)	What is the Pricing for hosted solution? You can go with subscription plan that will be credited into your account while paying & will be reflecting on web interface. You can check the every deduction of your call on your web portal. As your plan will be about to over, you can contact us to credit it again. Aria voice logger is being used since 2010. Product is advantageous towards customer satisfaction. Service rendered towards any issues related is being attended immediately without delay. Thank You. We awarded comprehensive Annual Maintenance Contract for the year 2016-17 for Dial 100 Application at our two locations (Kashipur & Rudrapur) to Aria Telecom Solutions (p) Ltd. 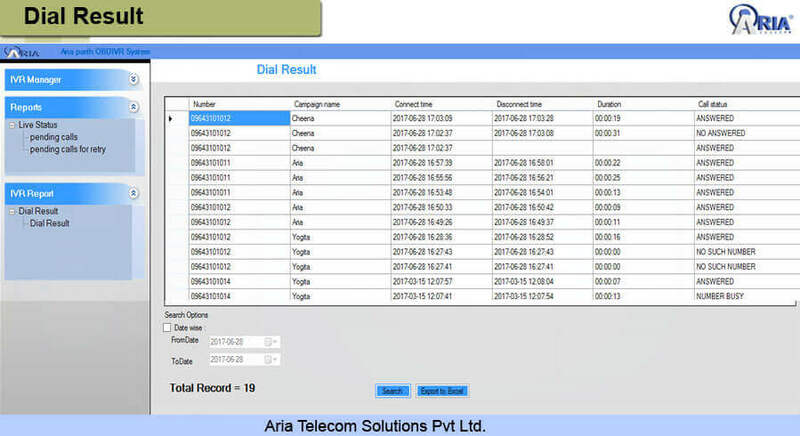 Aria Telecom upgraded the software & running the technology smoothly & trouble free. We are satisfied with your technology & support system. You as a relationship manager is very co-operative & always there for any help. Your technical team is also co-operative and has good knowledge of product. 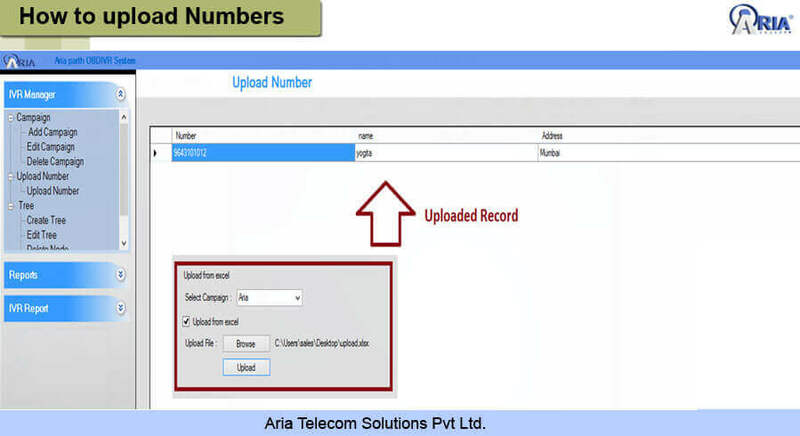 We are satisfied with products and support provided by Aria Telecom as we are using telephone recording system. We would like to recommend your product/services to our friends. 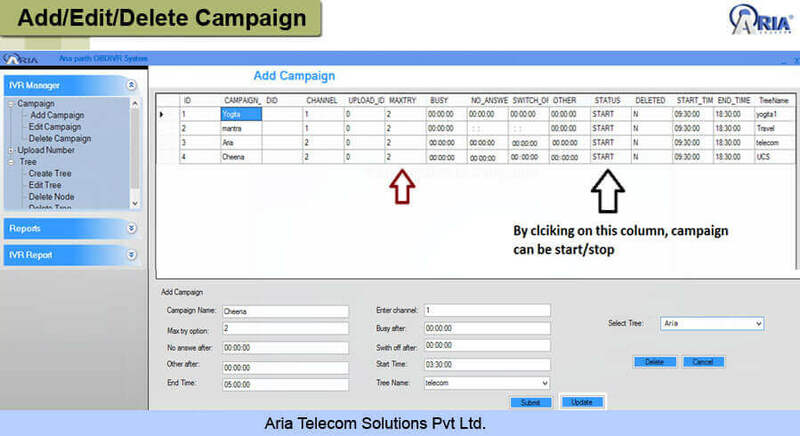 We are using Voice Logger of Aria Telecom Solutions Pvt. Ltd. We are fully satisfied with this product and we also appreciate support provided by Engineer of Aria Telecom. As our company is using PCI based voice logger of Aria Telecom. Product is advantageous. We are fully satisfied with product and support provided by company. We also like to know about company's new products. I am using Voice Logger since 3 years in 5 different locations. Product is really good and the service they provide is on time. Yes it has been installed completely and operational now. I am really thankful to you and your competent technical team who help to complete this job done successfully. Appreciated. Founded in 2003, "Aria Telecom Solutions (P) Ltd." has carved a niche throughout India, Africa, Nepal, Bhutan, UK and Bangladesh by offering a world-class range of stable software.